1B Umpire Mike Muchlinski ejected Mariners Manager Lloyd McClendon for arguing a ball two (check swing) call in the bottom of the 9th inning of the Mariners-Twins game. With two out and one on, Twins batter Kurt Suzuki attempted to check his swing on a 1-1 slider from Mariners pitcher Carson Smith. This play has been referred to the UEFL Appeals Board for further review (Check Swing). At the time of the ejection, the game was tied, 2-2. The Twins ultimately won the contest, 3-2. This is Mike Muchlinski (76)'s first ejection of 2015. Mike Muchlinski now has ? points in the UEFL Standings (-3 Previous + 2 MLB + ? Call = ?). Crew Chief Mark Wegner now has ? points in Crew Division (0 Previous + ? Call = ?). This is the 142nd ejection of the 2015 MLB Regular Season. 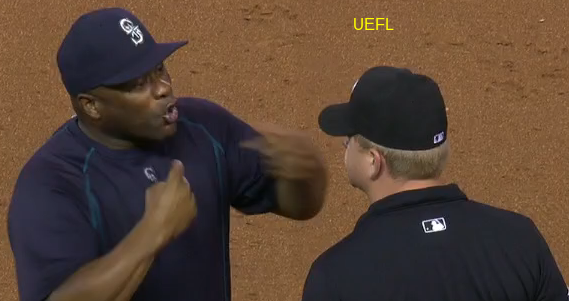 This is the 65th Manager ejection of 2015. This is the Mariners' 5th ejection of 2015, 1st in the AL West (SEA 5; HOU; LAA, OAK 3; TEX 2). This is Lloyd McClendon's 3rd ejection of 2015, 1st since June 2 (Will Little; QOC = Y [Check Swing]). This is Mike Muchlinski's first ejection since June 15, 2014 (Bruce Bochy; QOC = Y [Balls/Strikes]).